Just about every NFL and college football analyst talks about how dominant the Southeastern Conference is. They talk about how productive and NFL-ready professional players from Alabama, LSU and Florida are. And they aren’t wrong — the SEC does statistically produce the most NFL players of any college conference. But other conferences, including the ACC, aren’t far behind. The ACC placed third in active NFL players for the 2017 season with 226 players. In comparison, the SEC was first with 315 players, followed by the Big Ten with 245 players. This proves that schools in the ACC — including Pitt — have actually produced a solid number of NFL players. Pitt is tied for fourth-most Hall of Famers with eight NFL inductees — a title shared with Alabama, Michigan and Syracuse — and will likely have another player inducted in the coming years. With NFL season starting next week, let’s take a look at the current status of Pitt players in the NFL. When talking about Pitt players in the NFL, the first name that comes to mind is Larry Fitzgerald. The veteran wide receiver from the Arizona Cardinals still adds to his Hall of Fame career, even in his 14th season. Fitzgerald is a catch machine, securing over 100 catches the last three seasons in a row. He’ll look to climb the all-time ranks for catches, and has a good chance of finishing this season — presumed his last — in second place. He is now in third with 1,234 receptions, behind Tony Gonzalez with 1,325 and Jerry Rice with 1,549. In the past, a popular debate arose regarding whether or not former Pitt defensive tackle Aaron Donald of the Los Angeles Rams is the best defensive player in the NFL. He was the 2017 Defensive Player of the Year and was named to the first-team All-Pro for the third time in his career. Once he figures out his contract issue, which will likely make him one of the highest-paid players in the league, Donald will look to lead the Rams in a season with high expectations. Another record-breaking Pitt player in the NFL is Buffalo Bills running back LeSean McCoy — a player who was electric in his two seasons at Pitt from 2007 to 2008, where he accumulated 2,816 yards with 35 touchdowns. His performance was good enough to have him drafted by the Philadelphia Eagles in the second round of the 2008 NFL Draft. Now a veteran and a consistent Pro Bowl running back, McCoy ranks 29th all-time for rushing yards and is second among active players, only behind Adrian Peterson. He looks to crack into the top 20 with another 1,000-yard season this year, but many think that because of his age — he turned 30 in July —, this might be the end of his star performance on the field. Regardless, the Bills will need his production if they want to be competitive this season. A second notable former Pitt running back is Dion Lewis, who has found a new home with the Tennessee Titans after spending the past three seasons with the New England Patriots. Lewis looks to bring his versatility and speed to a young team in Tennessee. He evidently has the skills of a perfect pass-catching back in the Titans offense, a crew that features Heisman Trophy winners quarterback Marcus Mariota and running back Derrick Henry. Henry has a physical advantage, using his 6-foot-3, 238-pound frame to run through defenders, while Lewis is 5-foot-8 and barely weighs 200 pounds. The two will look odd next to each other, but their polar-opposite sizes will be trouble for NFL defenses. Two of Pitt’s best offensive players the last few seasons, running back James Conner and wide receiver Tyler Boyd, look to break through this coming NFL season. Already a local fan-favorite, Conner is expected to have a big impact this year with the Pittsburgh Steelers. He has the advantage of playing behind and learning from one of the best running backs in the NFL, Le’Veon Bell. Bell, who is still in contract debates with the Steelers, has not shown up to training camp this season. That means Conner has taken a lot of first team snaps and fans can see him on the field more frequently than last year. Once Bell returns to the team, expect Conner’s playing time to decrease. 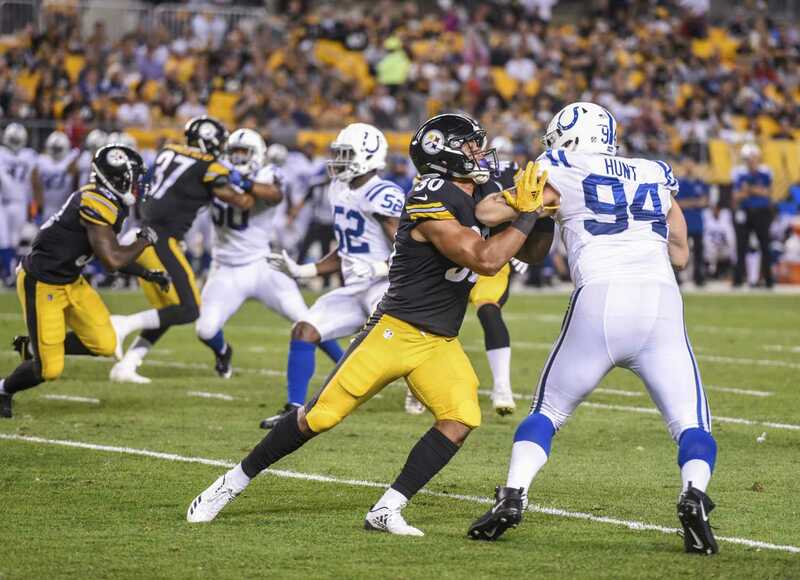 But with the time he does have on the field, fans can expect him to make big plays, which will make him a nice option in the Steelers’ high-powered offense. As for Tyler Boyd, this is a make-or-break season for him. The third-year receiver hasn’t had much success after getting drafted in the second round of the 2016 NFL Draft by the Cincinnati Bengals. His off-the-field issues and injuries allowed him to have only 22 receptions last season, a drop from the 54 he had in his rookie season. But the Bengals aren’t going to be very good this season, which means a lot of passing and potentially a ton of catches for Boyd. During the 2018 NFL season, fans will get the chance to see three new Pitt players contributing to teams. Offensive tackle Brian O’Neill was drafted in the second round by the Minnesota Vikings. He turned heads at the NFL Combine in March after running a 4.82-second 40-yard dash, the fastest by an NFL lineman since 2013. The Vikings are going into the year as a popular Super Bowl pick, and O’Neill can help them get there — especially after they fell short last season in the NFC Championship Game. Flipping to the other side of the ball, defensive backs Avonte Maddox and Jordan Whitehead both have made a name for themselves in preseason games. Maddox, a fourth-round pick by the Philadelphia Eagles, intercepted No. 1 overall pick Baker Mayfield in their game last week against the Cleveland Browns. Maddox showed off his speed and nearly took the interception back for a touchdown before getting tripped up. Down in Tampa Bay, Whitehead — another fourth-round pick — competed for a starting job for the Buccaneers. He suffered a shoulder injury early in preseason play, but that didn’t stop him from playing last week against the Detroit Lions and forcing a fumble. Reports have leaked talks of the Bucs using him on offense in a similar way to his time at Pitt. Whitehead has always been an impact player. His 101-yard fumble recovery for a touchdown versus No. 1 Clemson that should’ve counted was a great example, and he should continue that role in the NFL. As players coming out of the ACC, these former Panthers have proven themselves in the professional atmosphere as being NFL-ready. With the addition of Whitehead and Maddox, fans of their respective teams can expect to see influential plays from all Pitt alumni players across the board. As football season finally begins, keep an eye out for our own Panthers sharing their skills with the nation on Sundays.